وزیری, صنم, افتخاری یزدی, محمد, آدامیان, آرمن. (1395). تشکیل قطره در میکرو کانال متقاطع، تحت تاثیر میدان الکتریکی با استفاده از روش شبکه بولتزمن. نشریه پژوهشی مهندسی مکانیک ایران, 18(2), 42-63. صنم وزیری; محمد افتخاری یزدی; آرمن آدامیان. "تشکیل قطره در میکرو کانال متقاطع، تحت تاثیر میدان الکتریکی با استفاده از روش شبکه بولتزمن". نشریه پژوهشی مهندسی مکانیک ایران, 18, 2, 1395, 42-63. وزیری, صنم, افتخاری یزدی, محمد, آدامیان, آرمن. (1395). 'تشکیل قطره در میکرو کانال متقاطع، تحت تاثیر میدان الکتریکی با استفاده از روش شبکه بولتزمن', نشریه پژوهشی مهندسی مکانیک ایران, 18(2), pp. 42-63. وزیری, صنم, افتخاری یزدی, محمد, آدامیان, آرمن. تشکیل قطره در میکرو کانال متقاطع، تحت تاثیر میدان الکتریکی با استفاده از روش شبکه بولتزمن. نشریه پژوهشی مهندسی مکانیک ایران, 1395; 18(2): 42-63. تشکیل قطره، یکی از پدیده‌های مهم در جریان‌های چندفازی است. همچنین، روش شبکه بولتزمن جزء روش‎های جدید و کاربردی می‌باشد. در این پژوهش شبیه‌سازی شکل‌گیری قطره بوسیله‌ی روش شبکه بولتزمن و تحت تاثیر میدان الکتریکی برای یک میکروکانال متقاطع انجام شده‌است. برای اعمال میدان الکتریکی، از مدل لیکی دی-الکتریک استفاده شده‌است. از مدل‌های مختلف تک‌فاز و دوفاز برای صحت‌سنجی آن بهره گرفته شده است. نتایج نشان می‌دهد که اعمال میدان الکتریکی تاثیر مثبتی در تسریع روند شکل‌گیری قطرات دارد، با این کار قطرات کوچکتر با فرکانس بالاتر بدست آمده است که ایده ال و کنترل شده است. Jones, T. B., "Electromechanics of Particles", Cambridge University Press, (2005). 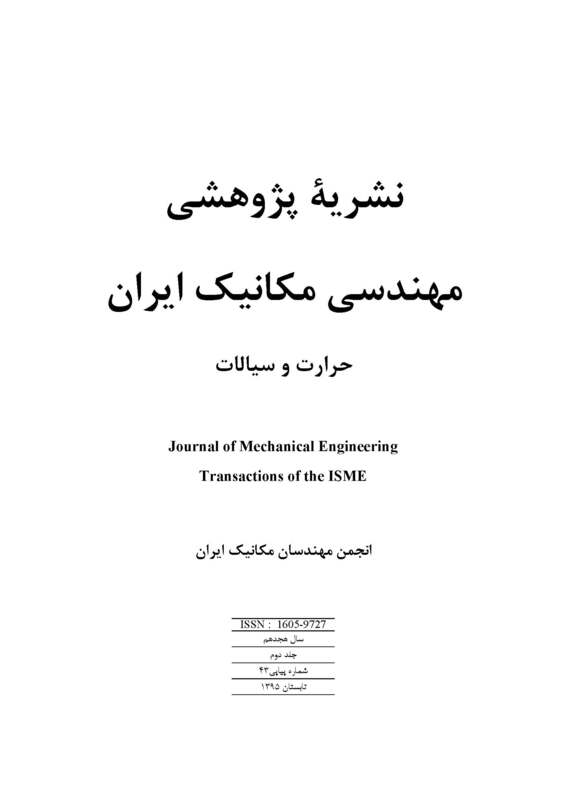 Eow, J.S., and Ghadiri, M.,"Electrostatic Enhancement of Coalescence of Water Droplets in Oil", Chemical Engineering Journal, Vol. 85, No. 2, pp. 357-368, (2002). Van der Graaf, S., Steegmams, M.L.J., Vander Sman, R.G.M., Schroen, C.G.P.H., and Boom, R.M., "Droplet formation in a T-shaped Microchannel Junction: a Model System for Membrane Emulsification", Colloids and Surfaces A: Physicochemical and Engineering Aspects, Vol. 266, No. 1, pp. 106-116, (2005). Zhang, J., and Kwok, D.Y., "A 2D Lattice Boltzmann Study on Electrohydrodynamic Drop Deformation with the Leaky Dielectric Theory", Journal of Computational Physics, Vol. 206, No. 1, pp. 150-161, (2005). Taylor, G., "Studies in Electrohydrodynamics. I. The Circulation Produced in a Drop by Electrical Field", Proceedings of the Royal Society of London. Series A. Mathematical and Physical Sciences, Vol. 291, No. 1 , pp. 159-166, (1966). Castellanos, A., and Gonzalez, A., "Nonlinear Electrohydrodynamics of Free Surfaces", Dielectrics and Electrical Insulation, Vol. 513, No. 3, pp. 334-343, (1998). Ha, J.W., and Yang, S.M., "Electrohydrodynamics and Electrorotation of a Drop with Fluid Less Conductive than that of the Ambient Fluid", Physics of Fluids,Vol. 12, No. 4, pp. 764- 772, (2000). Melcher, J., and Taylor, G., "Electrohydrodynamics: a Review of the Role of Interfacial Shear Stresses", Annual Review of Fluid Mechanics, Vol. 1, No. 1, pp. 111-146, (1969). Saville, D.A., "Electrohydrodynamics: the Taylor-Melcher Leaky Dielectric Model", Annual Review of Fluid Mechanics, Vol. 29, No. 1, pp. 27-64, January (1997). Lee, S., Im, D., and Kang, I., "Circulating Flows Inside a Drop under Time-periodic Nonuniform Electric Fields", Physics of Fluids, Vol. 12, No. 8, pp. 1899-1910, (2000). Trau, M., Sankaran, S., Saville, D.A., and Aksay, I.A., "Electric-field-induced Pattern Formation in Colloidal Dispersions Nature", Vol. 374, No. 6, pp. 437-439, (1995). Xing, X.Q., Butler, D.L., Ng, S.H., Wang, Z., Danyluk, S., and Yang, C., "Simulation of Droplet Formation and Coalescence using Lattice Boltzmann-based Single-phase Model", Journal of Colloid and Interface Science, Vol. 311, No. 2, pp. 609-618, (2007). Gong, S., Cheng, P., and Quan, X., "Lattice Boltzmann Simulation of Droplet Formation in Microchannels under an Electric Field", International Journal of Heat and Mass Transfer, Vol. 53, No. 25, pp. 5863-5870, (2010). Yang, Z.L., Palm, B., and Sehgal, B., "Numerical Simulation of Bubbly Two-phase Flow in a Narrow Channel", International Journal of Heat and Mass Transfer, Vol. 45, No. 3, pp. 631-639, (2002). Bararnia, H., and Ganji, D.D., "Breakup and Deformation of a Falling Droplet under High Voltage Electric Field", Advanced Powder Technology, Vol. 24, No. 6, pp. 992-998, (2013). Yu, Z., Hemminger, O., and Fan, L.S., "Experiment and Lattice Boltzmann Simulation of Two-phase Gas–liquid Flows in Microchannels", Chemical Engineering Science, Vol. 62, No. 24, pp. 717-718, (2007). Inamuro, T., Yoshino, M., and Ogino, F., "A Non‐slip Boundary Condition for Lattice Boltzmann Simulations", Physics of Fluids, Vol. 7, No. 12, pp. 2928-2930, (1995). Zou, Q., and He, X., "On Pressure and Velocity Boundary Conditions for the Lattice Boltzmann BGK Model", Physics of Fluids, Vol. 9, No. 6, pp. 1591-1598, (1997). Garstecki, P., Fuerstman, M.J., Stone, H.A., and Whitesides, G.M., "Formation of Droplets and Bubbles in a Microfluidic T-junction Scaling and Mechanism of Break-up", Lab on a Chip, DOI: 10.1039/b510841a, Vol. 6, No. 3, pp. 437-446, (2006).